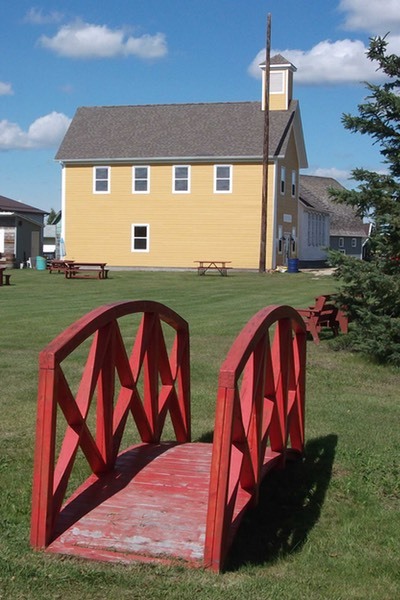 Stony Plain’s first Town Hall was built in 1909 by Israel Umbach and cost $845.00 at the time. The original Town Council had a Pitner pressurized gasoline lighting system installed and an official opening dance was held on News Year’s Eve, 1909. The two story building housed the Fire Department, consisting of a one horse drawn pumper, and two jail cells on the main floor. The upstairs was the Council Chambers along with the library, meeting hall, concert and dance hall, school room and even a training room for civil defence classes. It was decommissioned in 1958, when it was moved to the Baron family farm just south of the then town limits. In 2010, the remains of the original building was found by our Historian, Lorna Gable, and with the Town’s support, we built a new foundation and moved the one story building onto the museum’s grounds. Unfortunately, what was left of the building was too far deteriorated to be safe as one story, let alone restore back to the original two stories. We decided to take it apart and use as much of the original material in our other display projects and build a replica building. In 2013 we partnered with the design students of St Peter the Apostle High School in Spruce Grove. We worked with the group of amazing students, their teacher Mr. Donick, Kurzitza Designs, and UpTown Industries, and over the year we created new plans and started raising money and applying for grants to build the replica. By the beginning of 2015, we had the completed plans, sponsorship support from the Town of Stony Plain, Parkland County, a Federal Mobility grant for a wheelchair lift, and a CFEP grant from the Provincial Government in place. We broke ground in May, and by the end of October the outside was mainly finished and we had a new version of the “Old Town Hall”. In the winter of 2016 the interior and exterior were completed and we had the official public opening and dedication during the Farmer’s Day Weekend. The building is accessible to visitors year round, the ground floor houses our large lamp collection and the second floor will house our model railway display.